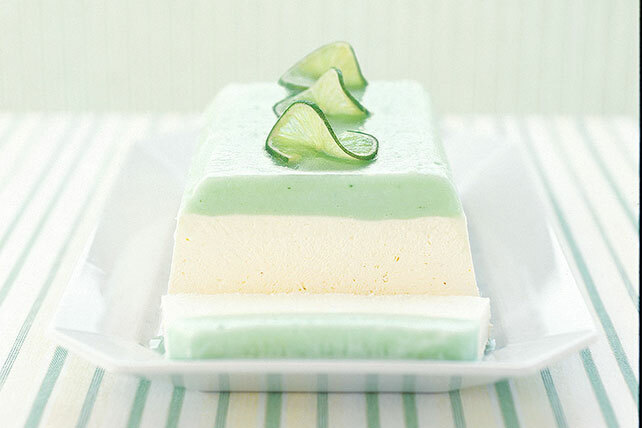 Make a luscious daiquiri-inspired Layered Lemon-Lime Dessert for the next party! This Layered Lemon-Lime Dessert is made with lime sherbet and lemon juice. Spoon sherbet into foil-lined 9x5-inch pan; spread to form even layer in pan. Freeze 10 min. Meanwhile, beat cream cheese spread in large bowl with whisk until creamy. Gradually beat in sweetened condensed milk until blended. Stir in COOL WHIP and lime juice. Enjoy a serving, one slice, of this cool dessert on occasion. Prepare using PHILADELPHIA Neufchatel Cheese, fat-free sweetened condensed milk and COOL WHIP FREE Whipped Topping. Prepare using lime sherbet and/or lemon juice. Place sherbet in microwavable bowl. Microwave on MEDIUM (50%) 10 to 15 seconds or until slightly softened. Store leftover dessert in freezer.